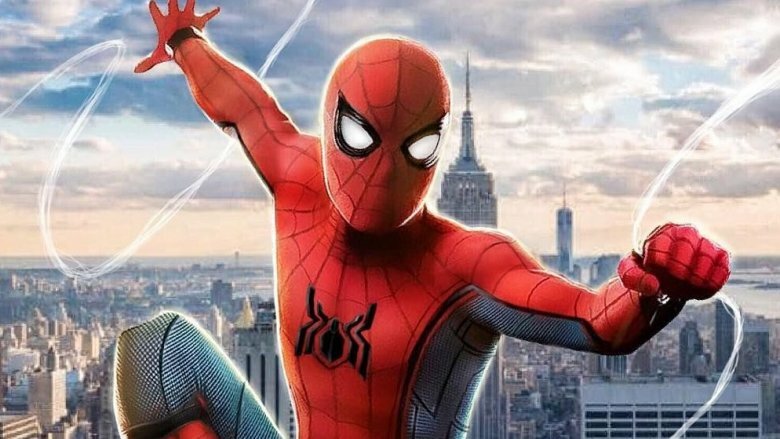 Peter Parker is getting some slick new duds in Spidey's second MCU solo outing. Comic Con Experience just wrapped up in Sao Paolo, Brazil, and on display was a replica of the black Spider-Man "stealth" suit, which will be featured in the forthcoming Spider-Man: Far From Home. Steve Weintraub of Collider was on hand to snap a few pics in true Parker fashion, and they are — how do we put this — freakin' sweet. Just a few days later, around the time of Sony's presentation at Comic Con Experience Brazil on Sunday, SuperBroMovies writer Daniel RPK shared the first official photo of the stealth suit — not on a mannequin but in action. 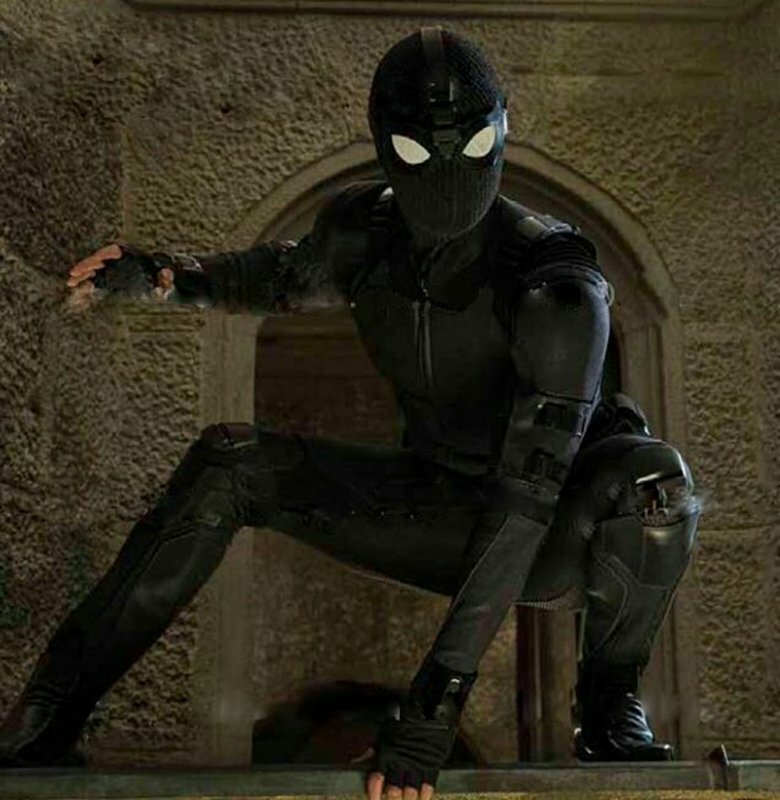 The photo — which isn't the highest resolution but is still, like we said before, freakin' sweet — shows Spider-Man star Tom Holland suited up in the sleek costume, perched on what looks like the edge of a window. This isn't the first instance in which Peter Parker has rocked upgraded duds. In Spider-Man: Homecoming, Holland's first MCU standalone, the burgeoning hero initially wore a homemade suit before slipping into the high-tech one Tony Stark (Robert Downey Jr.) designed for him. He was reckless with it, though, not wanting Tony to follow his every move via the tracker implanted in the suit and finding it frustrating that the "Training Wheels Protocol" Tony installed kept him from utilizing the suit's more advance features and subsystems. Disabling the tracker and bypassing the protocol got Peter into a sticky situation, and Tony eventually took back the suit as a way to reprimand young Spidey. But if you've been keeping tabs on Far From Home, then you already know that, thus far, Tony does not appear to be playing a part in the Spidey sequel. Many fans have taken this as indirect confirmation that Avengers: Endgame will mark the character's swan song, but we're not going to go so far as to say that, because we're not in the business of breaking hearts. However, Mr. Parker is confirmed to be getting an assist from former S.H.I.E.L.D. agents Maria Hill (Cobie Smulders) and Nick Fury (Samuel L. Jackson) in the upcoming flick, and it is pretty safe to say that the stealth suit looks quite a bit more S.H.I.E.L.D.-y than it does Stark-y. In stark contrast (sorry, we couldn't resist) to the ultra-high-tech Iron Spider suit featured in Avengers: Infinity War, the stealth suit features a decidedly more low-tech aesthetic. It looks to be composed of a fine mesh underlayer, over which are fitted several accessories: a flak jacket-like chest piece (complete with a visible zipper), eyepieces in the classic Spidey shape secured to the head with an apparatus reminiscent of night vision goggles, thigh pads, shin-high boots, fingerless gloves, and spiffy black web-shooters. We already know that a great deal of Spider-Man: Far From Home will be taking place in Europe (hence the title), but since very few actual plot details have emerged, it isn't clear what kind of sneaky missions might necessitate the new threads. The inspiration for the suit's design, however, is plain: it bears more than a passing resemblance to the outfit worn by Spider-Man Noir, an alternate universe version of the character who has popped up in the comics and who plays a major role in the hotly anticipated Sony animated feature Spider-Man: Into the Spider-Verse. Holland recently showed off a revamped version of his classic Homecoming suit on Jimmy Kimmel Live!, and while it does look pretty awesome, it's a fairly simple redesign, swapping out the blue portions of the original suit for black. The stealth version, on the other hand, is like nothing we've ever seen Spidey wear onscreen before. It may be designed for stealth, but it also looks capable of taking some heavy punishment. This seems to indicate that whatever the situation Spidey finds himself suiting up in this new get-up for, it's likely to involve a godly number of heavily armed adversaries. On a final note, you'll notice the absence of the iconic spider logo in the stealth suit; however, in the upper right-hand corner of the chest plate, there is a small, round patch that is curiously blank. It seems unlikely to be there for no reason — could this perhaps be where the S.H.I.E.L.D. logo will go? Sure, the organization's status is completely up in the air at this point in the MCU, and Fury and Hill haven't been directly associated with it for some time, but we can still speculate — and we just did. Check out Spider-Man's new look below. Spider-Man: Far From Home is due out on July 5, 2019.